Dissolved Gas Analysis (DGA) and moisture measurement of insulating fluids are recognized as the most important tests for condition assessment of fluid-insulated transformers. Every year asset owners deploy field crews to take thousands of fluid samples from transformers as part of periodic health checks and for immediate operational decisions. These samples are sent to offsite laboratories for analysis. The Kelman™ Transport X² is a portable ‘lab in a box’ device. In critical situations, the ability to perform DGA in less than 30 minutes on the spot, empowers asset owners to determine a transformer’s condition and thereby allow operational decisions to be made at the earliest opportunity. 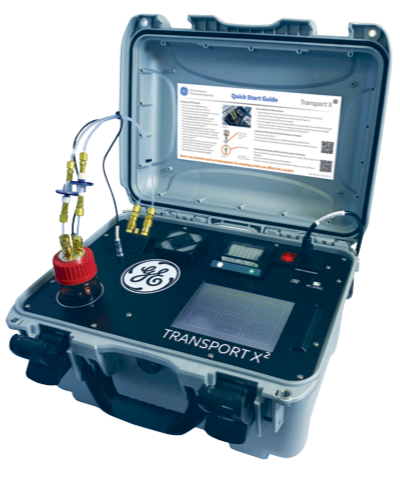 GE was among the first to deliver consumable-free DGA products to the market, and Transport X² represents the next generation of its portable onsite system. GE’s class leading Photo-acoustic spectroscopy (PAS) gas measurement technology, now in its fourth generation, provides laboratory-challenging levels of precision in a calibration free, easy-to-use and hand-carriable product. Benefiting from more than 40 years of global DGA experience, the Kelman Transport X² encapsulates intuitive advancements to bring improved performance, innovative new features, enhanced user experience and greater robustness.